In a hurry (I'm leaving): more long-legs! 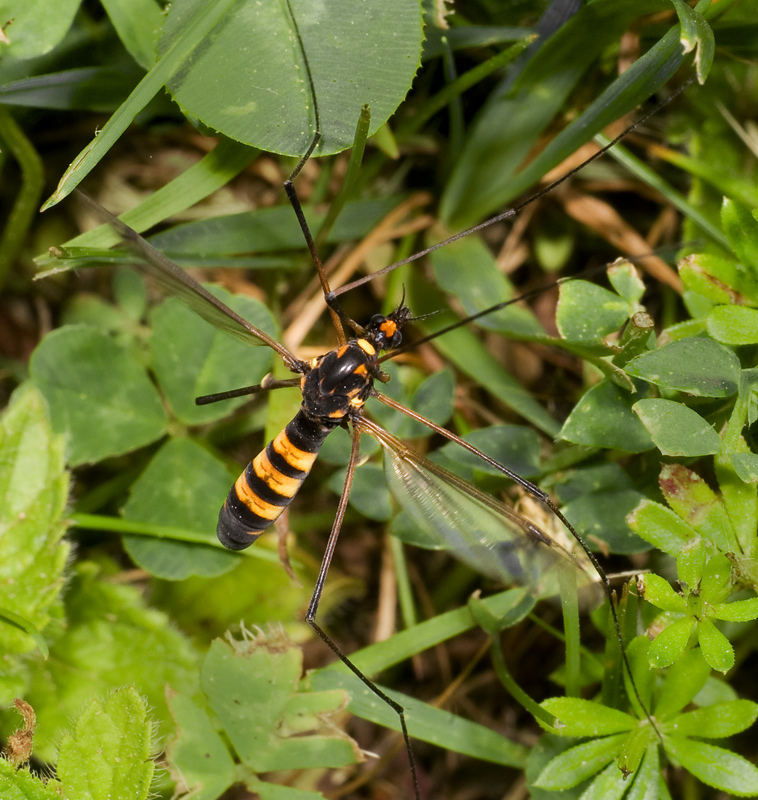 This nice 16 mm long female crane fly is a Heath banded tiger ( (Diptera; Tipulidae; Nephrotoma (=Pales) crocata; Gelbbindige Schnake). The species is wide spread from Egypt up to Northern Europe. ID: the bugger is easily recognized, there is a particular yellow pattern on the sides. Sexual dimorphism (males have 19-segment-antennae, the females 13 segmented antennae; the females have a pointed brown abdominal tip, not seen in this shot). Again J. Lindsay's URL can help (www.commanster.eu /commanster/Insects/Flies). Technical stuff: With post processing in PS first in RAW, then in TIFF I had to make the fly stand out some from the irregular background (this is its typical habitat though). I did it by desaturating and darkening the green and enhancing the contrast for the fly. The right wing was made to shine a little more than it had been. Muy buena captura Dietrich ! A pesar del complicado �ngulo empleado, resolviste bien la captura y diste buenos cortes, por lo que el encuadre es casi inmejorable. Gran profundidad de campo y buena luz. Excelente trabajo. und noch eine andere Spezies der Schnakenfamilie, unglaublich, wie viele unterschiedliche Du im Sommer fotografieren konntest. Diese hier hat sch�ne Farben, der K�rper sieht aus wie von einer Schwebfliege. Vielen Dank, sehr h�bsch und interessant. Sollten wir uns vorher nicht mehr "h�ren" - ich w�nsch' Dir einen guten Rutsch in ein gesundes und sch�nes Jahr 2010. Oh, yes, this is the one I spotted for the first time in our garden last summer! It is a beauty and very well portrayed here! Excellent sharpness and lovely colours! A fine capture of this spectacular Tipulid, one that we saw in our backyard! You managed the contrast with the busy natural BG well adn the POV shows all is features with fine sharpness and colours. Thanks and I wish you happy hunting in your backyard and elsewhere for 2010! Das ist aber eine ganz spezielle Schnake mit diesen gelben Streifen. Ich habe in B�rchen eine �hnliche fotogtafiert, das Bild leider beim Absturz des Computers verloren. Ich wusste auch nicht, dass es so viele Schnakenspezies gibt. Wie immer gut abgelichtet, von einem idealen Blickwinkel aus. W�nsche Dir noch "�s gu�ts n�is".